This season saw the coming of a dreadful "innovation" that defaced the Sporting Lisbon home shirt. Due to external imposition, and with ludicrous arguments of visibility of the player name and number, the back side of the kits started to have a very large area in one colour only, which in this first year was a huge white area that makes that the hoops are not hoops at all. In this year this happened only in the match worn shirts, that is, worn by the Sporting Lisbon player on the pitch. The replica shirts still kept the hoops. Furthermore, it is a slightly odd shirt, with a black diagonal stripe that starts below the arm pits on the front, continues to the back, where it separates the hoops from small areas that are completely white. The Stromp jersey also shows some novel elements, besides the split green/white it has some small additional features, and a completely green . The third Sporting Lisbon shirt of this season was in lettuce green colour, with black zig zag stripes that give the jersey a modern look. The football season almost brought glory to Sporting Clube de Portugal. Instead, it ended in catastrophe. 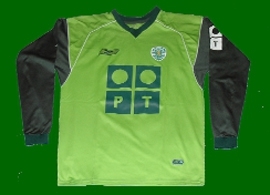 Click here to see all the Sporting Lisbon shirts from 2003 2004. Tello took the corner kick that led, in extra time, to the goal by Miguel Garcia that put Sporting in the UEFA Cup final in Alvalade. He was wearing this jersey. Worn by Rodrigo Tello in the second leg of the UEFA CUp semi final against AZ Alkmaar in the Netherlands. Player issue, offered by a Sporting Lisbon official to a AZ Alkmaar official. No sponsor, otherwise UEFA cup model, player Custodio. Stromp shirt, size 16 children. No sponsor. Stromp shirt player Rogério, short sleeves. Match worn by Custódio in the away game of the UEFA Cup pre-qualifier game against Rapid Wien in Vienna a 30 September 2004. 0-0.